Inspired by classic video games, Boss Monster challenges you to become a villain, build a dungeon, lure in adventurers... and destroy them. Boss Monster is a standalone card game that challenges 2-4 players to become vidogame-style villains and build deadly side-scrolling dungeons. Players compete to see who can lure and destroy the most adventurers. But beware! You must make your dungeon as deadly as it is attractive, or the puny heroes might kill you first! 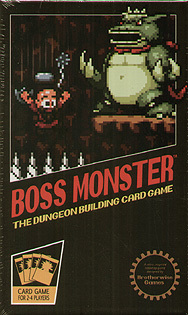 Are you a bad enough dude to become the ultimate Boss Monster?